I learned early on in my eco-transition how easy it is to green your beauty routine thanks to the amazing natural beauty companies out there creating gorgeous products that are safe for the earth and for my body. I know there's plenty of greenies out there who embrace a truly natural look and totally pull it off, but I just can't bear the thought of leaving my house without at least a quick swipe of lip gloss and mascara (not to mention all the fun that can be had with eye shadow, lipstick, bronzer, eyeliner. . .). Since mascara is by far my favourite makeup product, that was the first to be greened. 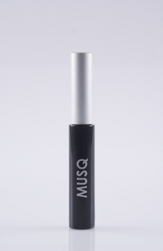 I've been using Musq mascara for over two years now, and in my checkered past with beauty products this qualifies as a long term relationship. I also have other Musq products in my makeup bag now, but more on that later. I'm not the only one who loves it, either, Musq won best natural mascara 2011 in the Natural Beauty Awards by Nature & Health magazine. So all you mascara lovers - get shopping! You'll be glad you made the switch. And the Skin Deep database is an amazing (if slightly scary) resource for checking out just what's inside your favourite beauty products. Let me know if there are any beauty products you'd like me write about!